An NYPD robbery detective uses his insider cop knowledge to rob rich criminals. The latest from Ben Sanders, following his novels American Blood and Marshalls Law. Rip-offs are a dangerous game, but heist man Miles Keller thinks hes found a good strategy: rob rich New York criminals and then retire early, before words out about his true identity. New town, new name, no worries. Retirement cant come soon enough, though. The NYPD is investigating him for the shooting of a hitman named Jack Deen, who was targeting Lucy Gatesa former police informant and Miless ex-lover. Miles thinks shooting hitmen counts as altruism, but in any case a murder charge would make life difficult. Hes ready to go to ground, but then Nina Stone reappears in his life. Nina is a fellow heist professional and the estranged wife of LA crime boss Charles Stone. Miles last saw her five years ago, and since then her life has grown more complicated: her husband wants her back, and hes dispatched his go-to gun thug to play repo man. Complicating matters is the fact that the gun thug in question is Bobby Deen, cousin of the dead Jack Deenand Bobby wants vengeance. BEN SANDERS is the author of American Blood and Marshalls Law, as well as New Zealand Fiction Bestsellers: The Fallen, By Any Means, and Only the Dead. 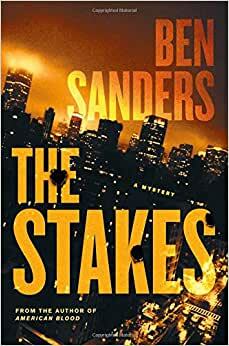 Sanderss first three novels were written while he was studying at university; he graduated in 2012 with a Bachelor of Engineering and now writes full-time. American Blood, his highly-anticipated American debut, published in November 2015, and the second in the series, Marshalls Law, in April 2017. Sanders lives in Auckland, New Zealand.